For us at Children’s Academy, we honor Election Day by holding a Professional Development Day. We recognize that closing for the day to our students is not ideal in the moment for families; yet taking this intentional time ultimately strengthens our community and increases our capacity to support each student & family. Today is both about professional learning and personal reflection. ‘How does my role at Children’s Academy fit into the mission?’ ‘What can I do this year professionally to meet student needs and push them forward toward healthy independence?’ Today is packed with continued learning in all our interdisciplinary domains: academics, speech & language, and occupational therapy. Staff is eager to share their knowledge while absorbing new information from the professionals around them. One word that keeps popping up today is “Joy.” It might not be a clinical term or an evidence-based intervention, but for us it is vital. We want to keep “Joy” afloat here at Children’s Academy. We want our classrooms and hallways to be places of success, experimentation, and growth. A sense of “Joy” is the key. Our short summer break flew by! We loved our time off, but we couldn't get back in action. The first day of school is always a little scary -- new teachers, new classrooms, new routines and new friends. But our students took the changes in stride, and we kicked off the school year with a wonderful first day. We'll keep you up-to-date on all that we're learning and doing throughout the year! Field day is one of our favorite days of the year, and this year did not disappoint. In the weeks leading up to the big day we practiced our team sports in gym class, learned and rehearsed ways to cheer on our friends, and tie-dyed our shirts in our team colors. Field day give us an opportunity to show our families all of the things we've been learning in class about sportsmanship, patience, and teamwork. Thanks to all the CA families who came to support our students. As always, we are so proud! Check out our Facebook album for more great shots of field day! Last week the 6th grade took a field trip to the New York Historical Society Museum. There, the students explored to the Mo Willems exhibit. Mo Willems is the author and illustrator of the books "Don't Let the Pigeon Drive the Bus" and "Knuffle Bunny: A Cautionary Tale." The students learned all about how Mo Willems got his ideas for his books and how he drew the illustrations. We loved how Willems named one of the characters "Trixie" after his own daughter. The students were able to walk around using an audio tour, narrated by Mo Willems himself, explaining many of his stories and artworks hanging on the wall for each part of the museum. While doing some spring cleaning, we came across this photo of Liza & Joshua, taken years ago. This feels both like yesterday and light years ago. These two little tykes are now teenagers, and they have come so far. They are growing up fast, whether we like it or not! 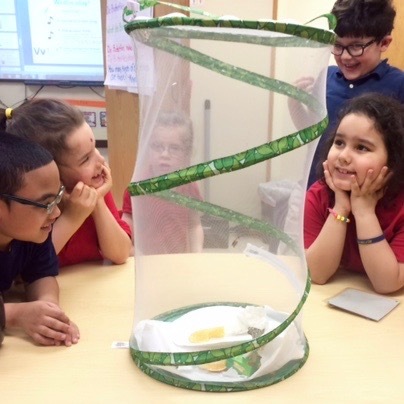 Our kindergarten and first graders have been learning about the life cycle of a butterfly. We asked questions like "do butterflies have toes?" (Yes!) and used pasta shapes to learn about the life cycle of the butterfly. We learned a lot during this unit, and not just about butterflies. We learned about patience as we watched the butterflies grow, being gentle with these delicate creatures, and about the cycles of life as we said goodbye to our butterflies as we set them free at the park.